Farewell, My Love are a five piece “theatrical rock” group that to date have released an EP titled A Dance You Won’t Forget and have signed a record deal with Standby Records. They are releasing their second EP Mirror, Mirror which is their debut release under the label. Their claim to fame is the way they fuse pop and rock elements to create a lively experience you won’t soon forget…even if you want to. 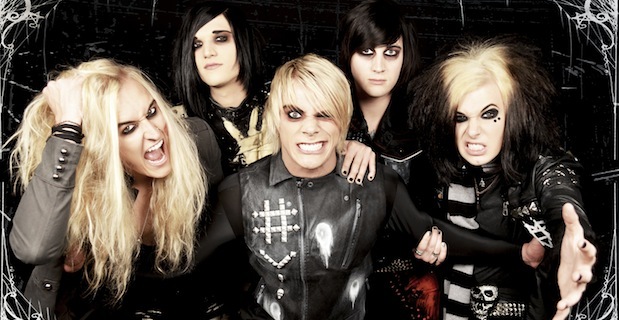 The lead singer’s voice resembles that of Cody Carson’s (Set It Off) at some points, and might also remind fans of old My Chemical Romance. High energy mixed with melodic pop rock is what their angle is, and it definitely seems to be working for them. They’ve already built a strong fan base and are growing in popularity amongst angsty teenagers everywhere. The song that stands out the most would be “Skip The Memories”. The little range the vocalist has is showcased here. The song is catchy and upbeat and will likely be what gets stuck in your head your first listen through of the album. “Just Another Soul” is their acoustic track, and while a lot of the lyrics are far from being great this is another opportunity to hear a little bit of Ryan’s range. The biggest issue the band has is their vocalist. His voice has no real range, it’s just consistently whiny and nasally. Aside from that, the rest of the band sounds pretty good and definitely are what carries the band. If they switched Ryan Howell out with someone else and wrote some stronger lyrics they could potentially have a great rock band. Their current sound will only manage to keep them where they are now rather than pushing them forward in the music scene. It’s nice to see someone do a cover of “It’s My Life”, but that’s a tough song to get right given it’s a popular song by an incredibly popular band. While I wanted to like it, they just didn’t do the song justice. There’s so much that can be done with it to make it unique and the band could really make it their own but there’s no passion in it. He sounds more like he’s singing along to the song at karaoke night rather than reinventing a song that someone already did. These guys easily have the kind of gimmick that appeals to teens and young adults, kind of like the way MCR somehow managed to take over all of my junior high/high school friend’s lives for many years. That kind of thing really does draw in fans, but they also need to make sure that they have the talent to back up their gimmick otherwise they will be over much sooner than later. We will just have to see where these guys end up as their sound evolves.